Today began with sunny skies and a tailwind from the north, though not as strong as yesterday’s. Clint and I felt bad for the northbound cyclists yesterday who were riding uphill into the wind. While taking a break on the climb out of Florence, we saw a couple of other cyclists going over the hill. 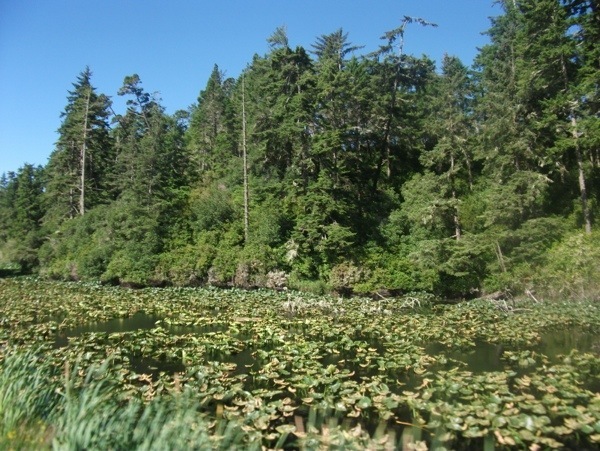 US101 in this area was mostly forested on both sides, until there was a break with some small ponds and lakes. Finally we figured out that even though we were traveling through areas with sand dunes, the road would be on an easier to build and maintain part on more solid ground. So we’d have to leave US101 in order to see any dunes. We saw a road to the Takenitch Dunes Campground and Trail, and so we turned off. 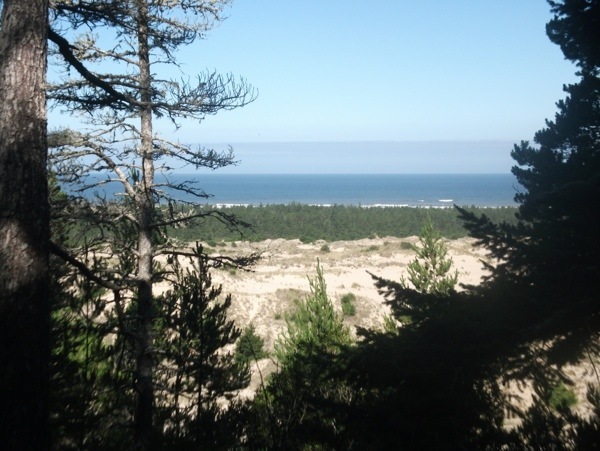 We found a trailhead and started hiking to the dunes through the forest. After about a mile, we got to a point to where we could see the dunes and ocean. A worthwhile detour! There were a few taller sand dunes nearby which were easy enough to climb, even in bike shoes. We started back on the trail towards our bikes. 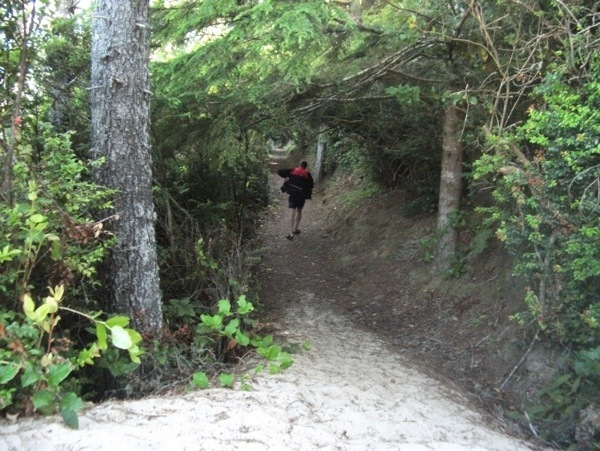 I thought it was neat how the sand from the dunes blends with the forested trail. On our way back, we bumped into a guy and his two dogs. 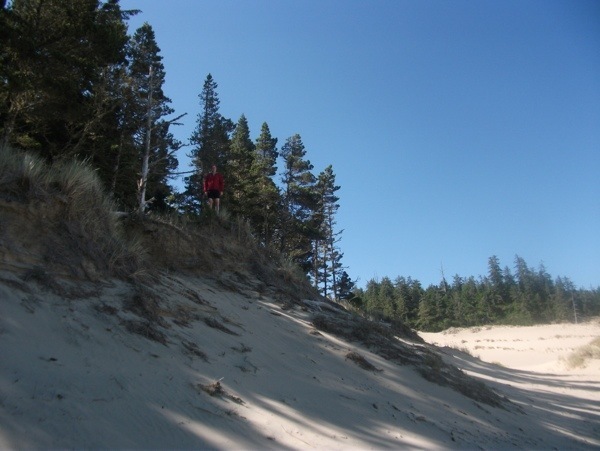 He told us we missed the best part – we had to continue across the trail to the dunes and you could eventually reach the ocean. So we continued on, marching in the sand dunes, with sand getting inside the shoes through the vents. Eventually after another mile or so, we reached this fork in the trail. A nice view, but honestly it wasn’t what we expected. But, hey, that’s part of the adventure. So we cut our losses and trudged back to the bikes, emptying a pound of sand out of each shoe before getting back on the bikes again. 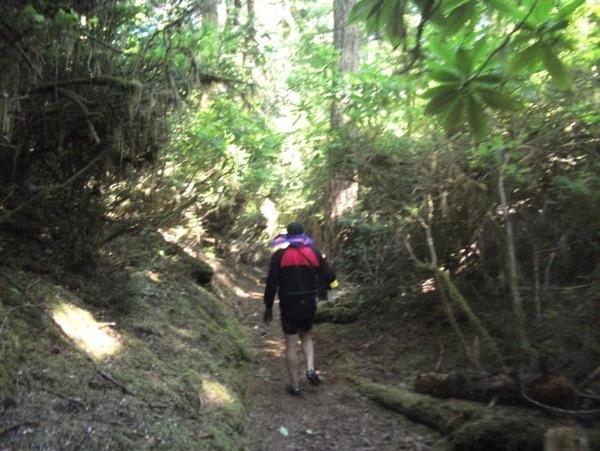 We continued back on the route. Although more of the scenery is beautiful, you sometimes see things like this. We stopped in Gardiner to eat our sandwiches we had packed for lunch. 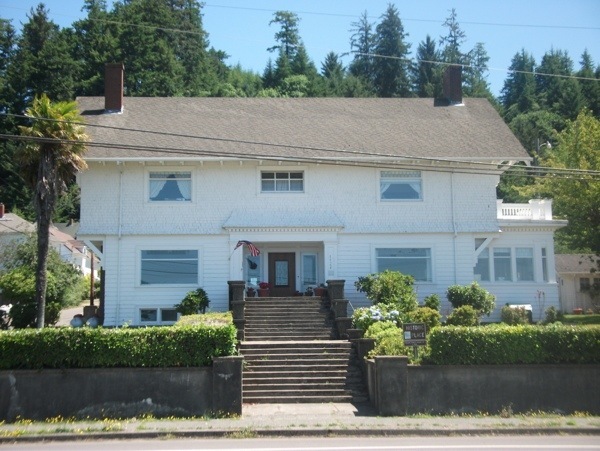 I noticed this house which had a historical marker in front. 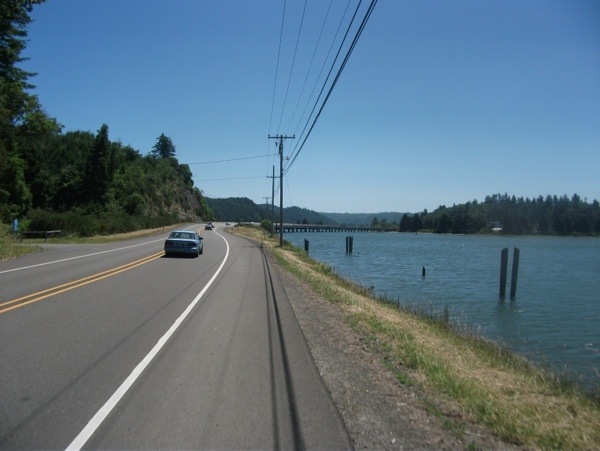 After Gardiner, it’s a relatively flat cruise along the Umpqua River. 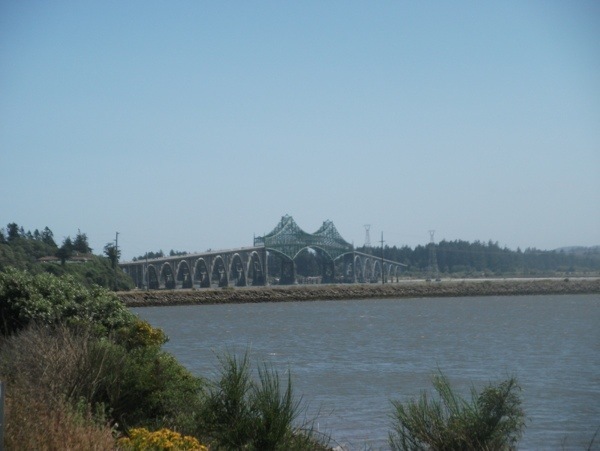 And then we crossed the bridge into Reedsport. When we got to the other side, we saw Jay, David, and Jeff again. They had camped at Honeyman State Park (near Florence) last night, and they said Marcus the German bicycle tourist was there too. 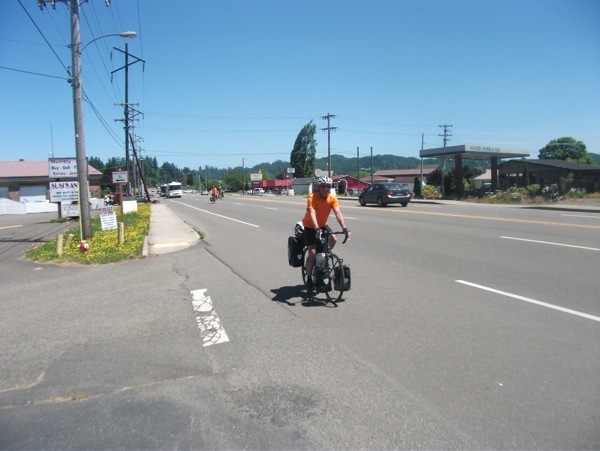 We stopped at the 7-11 in Reedsport. The owner complimented us on our bikes, he said he was driving from Florence and had seen us in Gardiner. 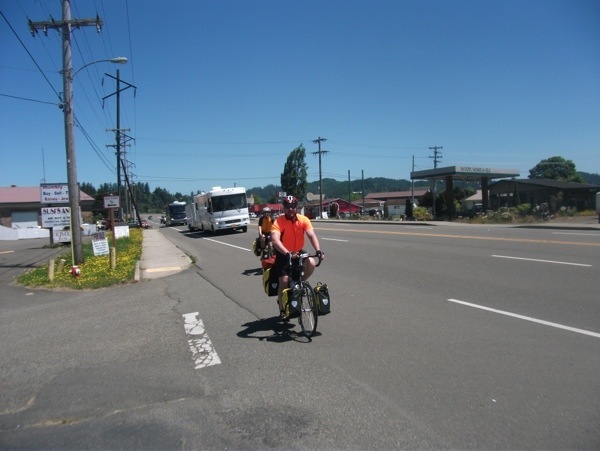 The three guys stopped in Reedsport, while we continued on. 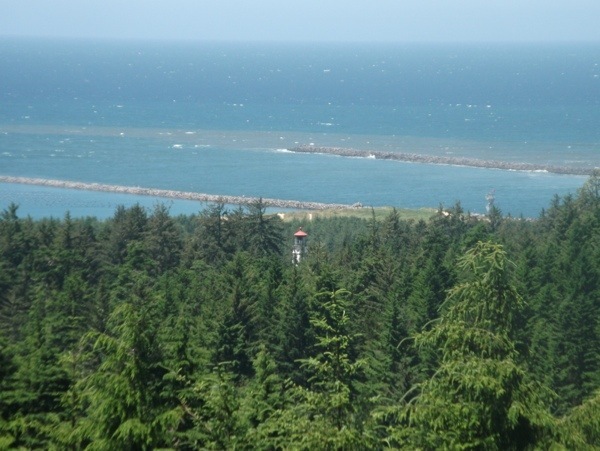 The route passed by the Umpqua lighthouse. 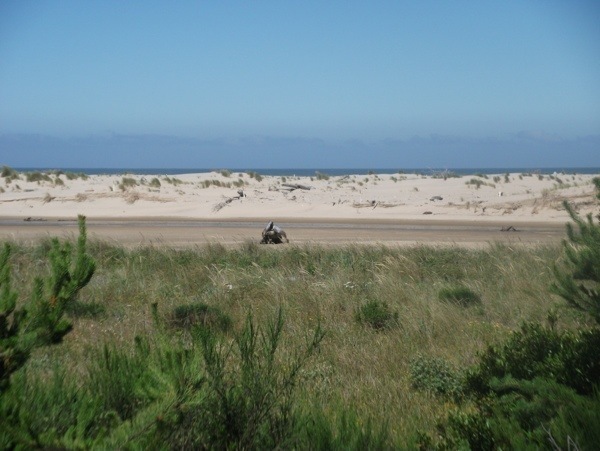 We saw that the Oregon Dunes National Recreation Area was only a 1/4 mile turnoff from US101. 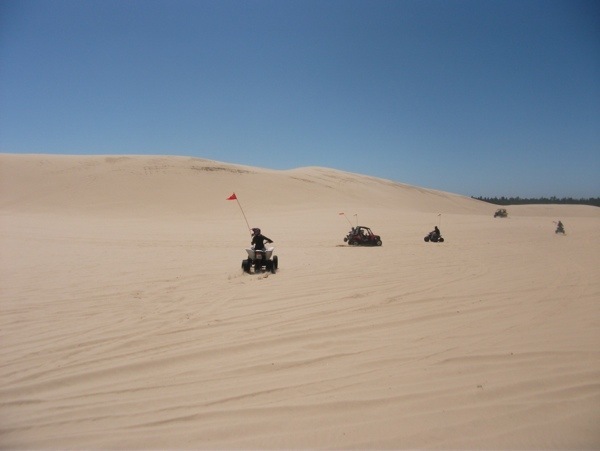 So we went there to check out some of the dune buggies. When we got back on route, we bumped into the three guys again. We stayed together for a while, and I even got some video which I will have to upload after the trip. 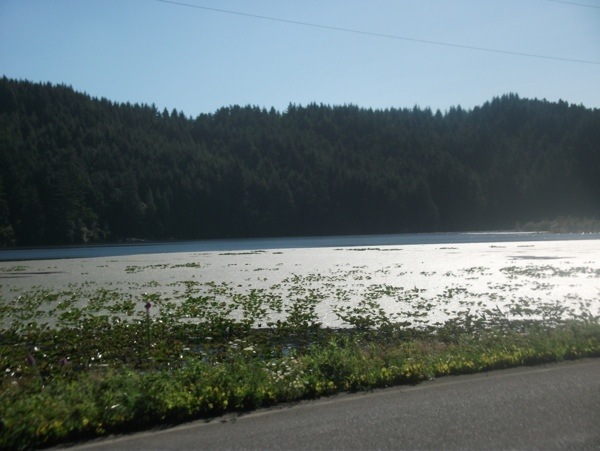 Just before the narrow two lane mile long bridge to North Bend, they stopped to regroup and rest, while we continued on. There was a traffic light for a cross street just before the bridge, and we had made it through the light just before the red. So that meant we had the bridge to ourselves for a while! 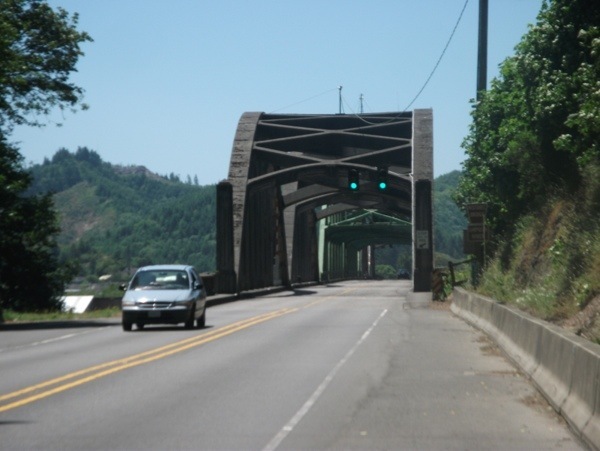 Clint pushed the button to activate the flashing warning lights indicating there were bicycles on the bridge. He signaled for me to take the lead. I jumped out of the saddle as the flat approach turned into a grade. With a strong tailwind assist, that easily put me over 20 mph, after which I sat down and maintained that speed on the uphill. Mind you, that was on at least a 5% grade on a loaded touring bike! But as I got near to the top of the bridge, the traffic ground to a halt, and I stopped behind it. Clint was able to filter forward through the traffic stopped behind me, and we agreed it was safe enough to filter forward through the jam. We got to a point where we couldn’t filter forward anymore. We then saw there was a handcuffed man being put into the back of a police car. There was an empty pickup truck in the other lane, so we were guessing this may have been a suicide attempt by jumping from the bridge. We lifted our bikes up the high curb to the narrow bridge sidewalk. We felt the strong crosswinds which were much stronger on the sidewalk than in the lane, and they were blowing us back towards the travel lane. 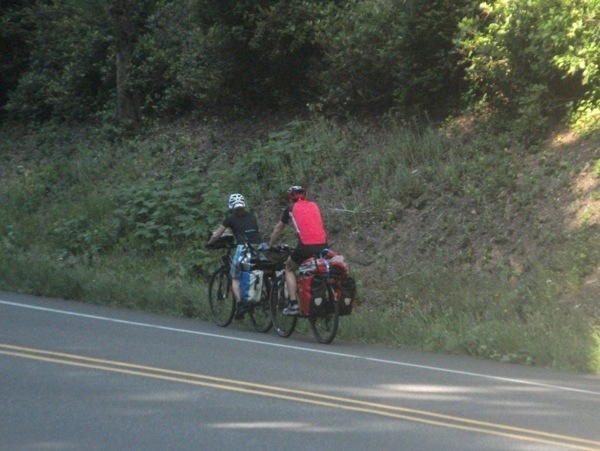 So we walked the bikes on the sidewalk until we got past the traffic backup and then got back on the road for a traffic-free descent into North Bend. 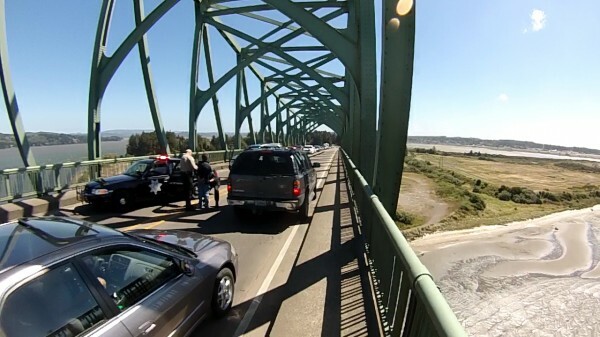 Afterwards, I remembered that I had the video camera on for the whole bridge ride! I will have to see how it turns out when I get home. 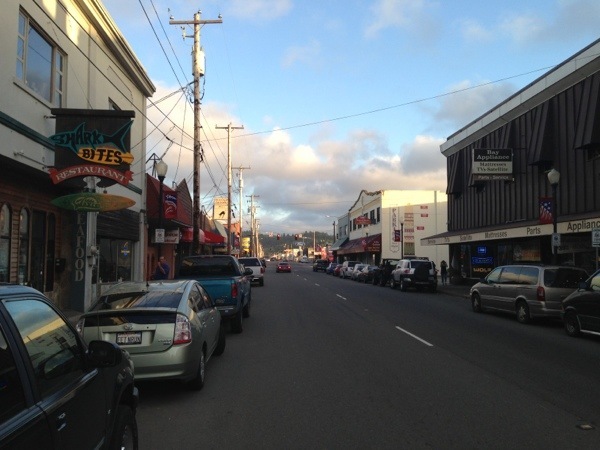 After checking into the hotel in North Bend, we went to downtown Coos Bay for some dinner. 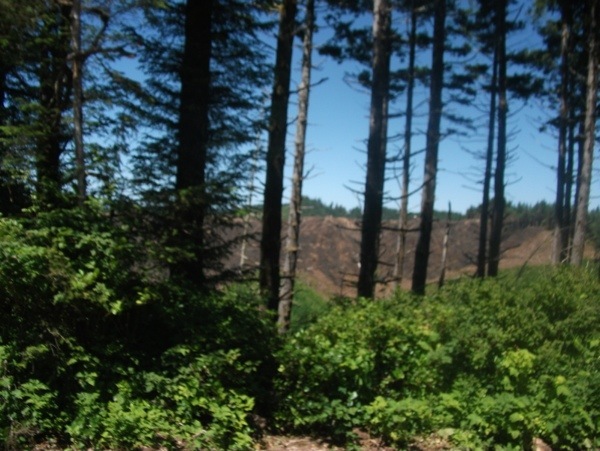 This entry was posted in Bicycling and tagged acaPacCoast2013 on July 4, 2013 by BikingBrian. Happy (Belated) 4th July! Looks like the weather (sun, no rain) been good most of the trip. Thanks!